Airship Graf Zeppelin. 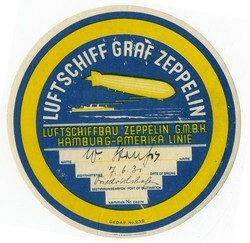 Luftschiffbau Zeppelin GmbH Hamburg-America-Linie. Round baggage label inscribed by Hand. Zeppelin leaving 7.6.1931. Diameter 120mm. 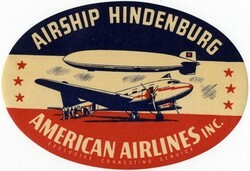 Airship Hindenburg - American Airlines. Luggage labe advertising the connecting flights to the airship service. Unused.